Imagine...acres of native grassland bordered by rolling, forested hills. Prairie wildflowers lending hues of white, gold and brilliant orange to spring and summer landscapes. The bronzed stems of prairie grasses swaying with the fall breezes. Perhaps somewhere in the prairie provinces, you think. Surely not in south-central Ontario. Well think again...all of this can be experienced here in Wasaga Beach! Tallgrass (prairie) habitats spread northeast from the Great Plains into southern Ontario about 5,000 years ago at a time when the local climate was relatively warm and dry. Colonizing dry sand plains, ridges and dunes, these habitats were once widespread in southwest Ontario with local occurrences extending eastward to Rice Lake and north to Wasaga Beach. First Nation communities likely managed these landscapes with fire, rejuvenating the grasslands to assist with travel and hunting. Tallgrass habitats were generally fertile and, compared to the forests of southern Ontario, easy to clear - they were rapidly converted to farm fields and communities during European settlement. 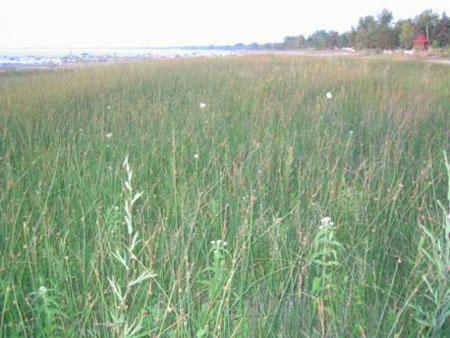 Today, less than 1% of the pre-settlement tallgrass habitat in Ontario remains. This pattern of tallgrass habitat loss occurred throughout North America. Tallgrass habitats are now considered globally rare. In Wasaga Beach, provincially and globally rare tallgrass habitats are mainly associated with a series of rolling and high sand dunes which blew inshore after water levels fell in Georgian Bay about 3,000 years ago. Being high and dry, these habitats were colonized and stabilized by tallgrass (prairie) vegetation. Historically, fire was an important part of this system, rejuvenating the open tallgrass communities and forestalling development of closed forest ecosystems. The dry, infertile sands and steep slopes associated with the dunes were not conducive to agriculture or settlement. Large stands of timber were harvested in the Wasaga Beach area in the 1860s and 1870s - fires raged through dunes which no doubt benefited tallgrass habitats - however, the typical pattern of conversion of tallgrass habitats to agriculture and settlements did not occur. Most of the tallgrass dune habitats came into provincial ownership in the 1960s and 1970s, forming the inland component of Wasaga Beach Provincial Park (smaller remnants can also be observed outside the Park). The trail network associated with the Park is the best way to view the tallgrass communities. The golden-hued Hoary Puccoon festoons the verges of Powerline Road in June to be replaced by the brilliant orange blossoms of butterflyweed in July and into August. Prairie grasses such as Indian Grass, Little Bluestem, Big Bluestem, Canada Wild Rye and Switchgrass mature in late summer and add their flair to the landscape through fall and early winter. Aside from being special in their own right, tallgrass habitats support a range of wildlife. White-tailed deer frequent the clearings in large numbers as they enter and exit their winter yards deeper within the Park. The Threatened Eastern Hog-nosed Snake requires dune habitats for nesting and moves between other tallgrass habitats to forage, hibernate and mate. Declining grassland bird species such as Grasshopper Sparrow and Golden-winged Warbler inhabit the larger tallgrass meadows. Experience the sensation of paddling through a silver maple swamp in April and May, surrounded by the soft "quacks" of wood frogs or a cacophony of "snoring" leopard frogs. Course through lily pad beds on a shallow lake fringed with wild rice and buttonbush in the summer months while common nighthawks cavort overhead, filtering insects out of the evening sky. Thrill to the strike of a northern pike in a landscape framed by the gold and russet hues of autumn. Jack's Lake is an easily accessible natural treasure and is a prime spring, summer and fall destination! Jack's Lake - named after an Ojibway named John Jack who owned a home along the lake in the 1830s - is a widening in the Nottawasaga River that is a small remnant of an extensive lagoon that covered low-lying areas south of the present-day dunes during higher lake levels more than 3,000 years ago. Most of the lake is less than 2m deep. Its nutrient-rich sediments support rich growth of aquatic vegetation including large lily beds which dominate the western basin during the summer months. The provincially significant marshes of Jack's Lake support a rich array of waterfowl and other marsh birds, particularly during the spring, when numbers of migratory waterfowl stop by to rest and forage on their way to breeding grounds to the north. Floodwaters accumulate in the extensive floodplain areas around Jack's Lake each spring before making their way downstream through the dunes of Wasaga Beach Provincial Park and urban Wasaga Beach to Georgian Bay. Dominated by silver maple swamp, these floodplains provide canoeists with an opportunity to paddle through the forest. 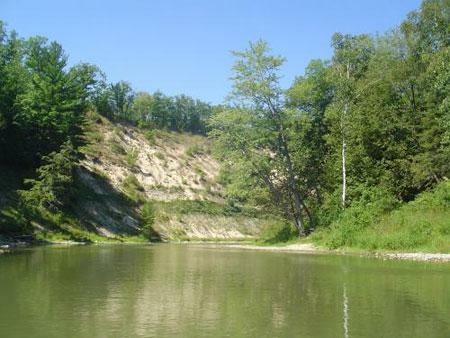 This is a similar experience to the Minesing Wetlands canoe route but is less challenging and can easily be accomplished within a couple of hours. Northern pike, bass and walleye provide good angling opportunities from spring through fall while rainbow trout (spring and fall) and Chinook salmon (late summer and fall) can be angled during their spawning runs to areas further upriver. The canoe launch area, with free parking, at Klondike Sports Park is an ideal departure/return point for a trip to Jack's Lake. Simply paddle (insert distance) upstream past the Klondike Park Road bridge and Jacques' Landing Trailer Park to the lake. There are no rapids through this stretch and the placid flows are ideal for novice paddlers, although they can be stronger during the high water periods of spring.. A return trip can easily be accomplished within two hours. Please use common sense and have regard for water and weather conditions while canoeing. Personal floatation devices should be worn and other standard small vessel safety devices (bailer, whistle, throw rope, waterproof flashlight) must be in the canoe at all times.